Acer isn’t the only vendor showing off a small Windows 8 tablet at Computex this week. 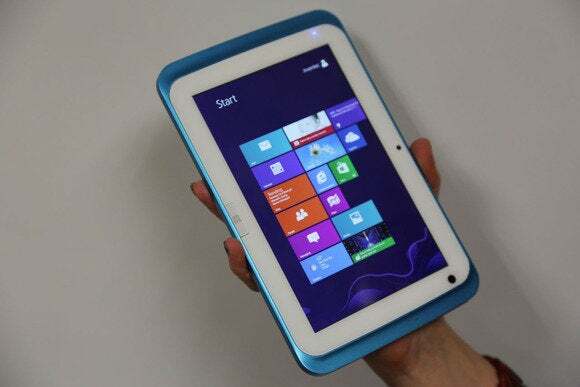 A lesser-known company called Inventec is building its own Windows 8 tablet, called Lyon, with a 7-inch, 1280-by-800 resolution display and a 1.66GHz Intel Bay Trail quad-core processor. Reportedly one of the tablets that Microsoft flaunted during its Computex keynote, Inventec’s tablet also underwent some hands-on time from MobileGeeks. The tablet has an IPS display, which appears to provide some excellent viewing angles, and its 7-inch screen should make it a little easier to hold in one hand than Acer’s 8-inch Iconia W3. Other specs include 2GB of RAM, 64GB of storage (with a 128GB model in the works), front- and rear-facing cameras, a microSD card slot, microUSB, and microHDMI. The tablet weighs roughly one pound and measures about 0.43 inches thick. Although the prototype runs Windows 8, the finished product should come with Windows 8.1. And due to its small size, it should also qualify for a free copy of Microsoft Office Home & Student. Just don’t expect to see Inventec’s name on the final product. As Liliputing points out, Inventec manufactures devices on behalf of larger Western PC makers, such as Acer, HP, and Toshiba. That means we’ll likely see some 7-inch tablets with similar specs to the Lyon showing up around the holiday shopping season. Since this is just a reference design, certain aspects of the tablet, including its look and feel, could change. As expected, there’s no word on pricing, but keep in mind that the Acer Iconia W3’s base price will be $379 in the US. Although Intel hopes to push tablet prices under $200 with its Bay Trail processors, the cost of Windows tablets will likely be more expensive due to Microsoft’s licensing fees and the larger storage requirements of Windows 8. Asus has said that it plans to release a small Windows 8 tablet later this year that costs less than $300.